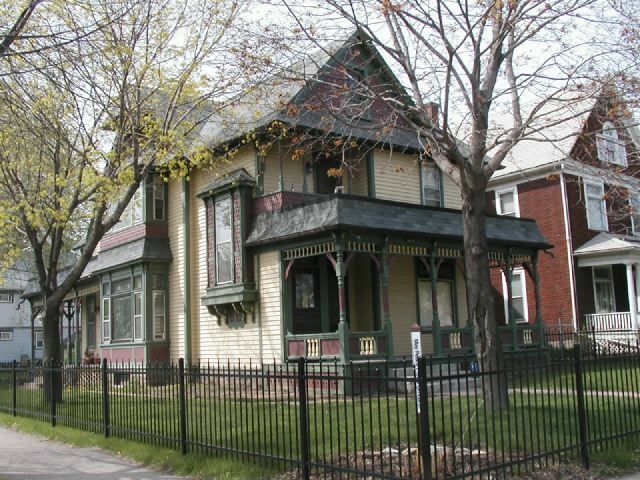 Built in 1886, this stately Queen Anne was first owned by an A. Massolt, who operated a brewery on Plymouth Avenue and North 2nd Street (where Standard Heating and Air Conditioning is currently located). During the Prohibition era, Massolt began production of root beer, and Massolt Root Beer was a popular brand into the 1950s. Standard Heating and Air Conditioning keeps a collection of Massolt cans and bottles unearthed when they built their building on Plymouth Avenue in the 1930s. This home went through many transitions, eventually being used as a three-unit rental apartment building for a number of years. Beginning in 2004, it underwent another complete renovation, and was converted it to a duplex more appropriate to the period in which it was built. During this process, local restorationists--the owner, neighbors, the state historical architect (an Old Highland resident), and several skilled carpenters who lived in the neighborhood--used salvaged materials to highlight its original charm. One significant change was the removal of the modern brown asphalt siding that ran all the way down to the limestone foundation. The home's most prominent feature, the porch, also received particular attention. The posts on the porch were custom-made to match historical photos, along with spindles, porch railing, and skirting. Remnants of the original porch railings were discovered underneath the porch, and used to help restore the original ones. 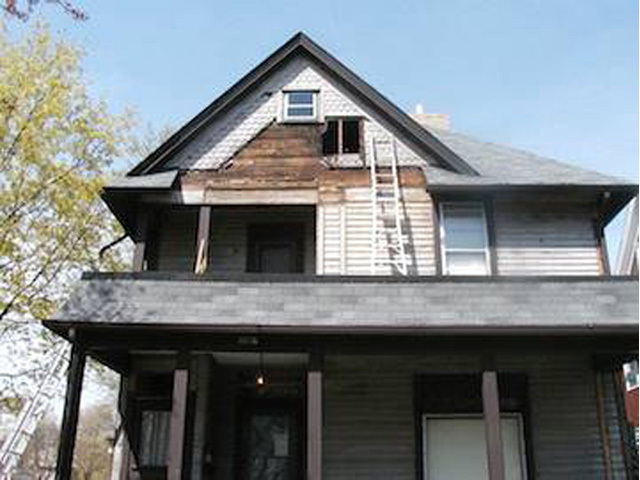 Scars observed after the removal of the asphalt siding ("ghost marks") also supplied clues as to the original intention and design of the open front porch. Architectural details formerly obscured in drab, gray, peeling paint and sun-faded, unpainted, wood trim now pop through the use of lively colors. A water cistern was discovered under the kitchen, collecting rain water that ran off the roof. The basement is exceptionally deep, with dramatic 12-foot ceilings. One theory as to why the basement was constructed to these specifications was that the ground temperature through Minnesota winters and summers was thought to be consistent enough to accommodate A. Massolt's beer storage. As you travel to the next stop on the tour, take a moment to note several other homes on this corner of 16th Street and Dupont Avenue. Do they look unusual in this neighborhood of Queen Annes...? These infill homes date from the 1960s and 1970s ("infill" refers to new buildings built into an already-existing neighborhood). The porch has a band called a "spindle frieze"mounted between the tops of the columns and the porch beam. The porch also features alternating vertical paneling and balusters between the columns; you may have noticed the similarities between this porch and the one at 1731 Dupont. 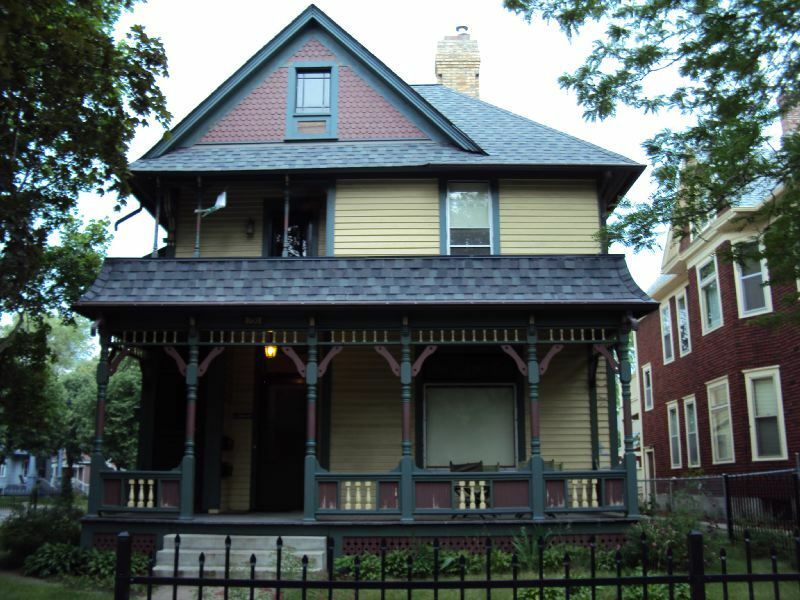 In fact, the porch at 1731 Dupont was modeled on this one. The brackets at the top face of the columns support the porch's soffit. The home has an asymmetrical façade and a steeply-pitched roof with an irregular shape (cross-gabled with hip) and a dominant front (east)-facing gable. Note the patterned shingles on the third-floor gable. The south façade features an ornate oriel window (a window projecting out from the house and suspended above the ground) with patterned shingles; a prominent two-story bay with intricate stained-glass windows; and a one-story porch with turned spindlework on the balustrade and a frieze suspended from the ceiling. The porch roof continues across the south-side bay, projecting outward and across the face of the bay, and the profile of the mansard shape complements the front porch mansard roof. The top gable on this south façade still has remnants of the asphalt siding that was mostly removed during the 2004 restoration. This house is typical of other Old Highland homes on corner lots, in that it makes excellent use of its side elevation, using the extra space to create more light in the house with prominent two-story bay windows. The house was added on to several times early on, probably around the turn of the 20th century. 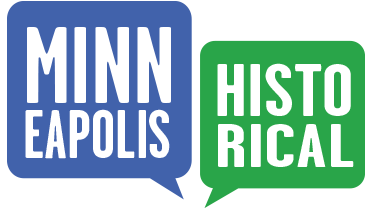 Old Highland Neighborhood Association, “1601 Dupont Avenue North,” Minneapolis Historical, accessed April 22, 2019, http://minneapolishistorical.org/items/show/18.